Credits2Careers Veterans Portal allows students to see how their work experience translates into academic credits at TCC and other community colleges. 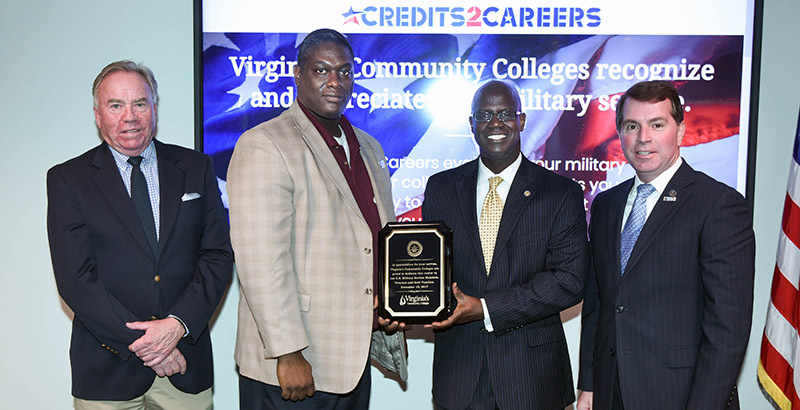 Pictured above, from left: Chancellor Glenn DuBois, Virginia’s Community Colleges; Coby Dillard, veterans resource liaison at TCC’s Center for Military and Veterans Education; Carlos Hopkins, Virginia secretary of Defense and Veterans Affairs; Bill Brown, executive director of TCC’s Center for Military and Veterans Education. Prospective veterans and military-related students at Tidewater Community College will have an easier time earning credit for prior learning thanks to a new online tool. The Credits2Careers Veterans Portal will allow students to upload their Joint Services Transcript to see instantly how their work experience could translate into academic credits at TCC and more than 1,700 other community colleges. “The Credits2Career tool helps military and veterans get a true snapshot of what credits and careers are out there for them based on what they have done in the military and the training and schooling they have completed,” said Bill Brown, executive director of TCC’s Center for Military and Veterans Education (CMVE). Military-related students comprise approximately 35 percent of TCC’s enrollment. Matt Adams, a Marine Corps reservist, who is currently attending TCC demonstrated the portal at its unveiling last week at the Virginia Community College System office in Richmond. Virginia’s Community Colleges served 36,868 veterans and military-related students last year. The portal can be accessed at this link: www.credits2careers.org. For information, contact the CMVE at military@tcc.edu or 757-822-7645.